So you have decided to hire a professional janitorial cleaning service for your business offices. This is a smart move. You are going to have your mind at rest from now on that your company spaces will be clean and trouble-free. You can put your attention on important aspects of the day-to-day operation of your company. One thing we would like to point out, however, is that as you review companies to hire, you should inquire into the certification of the cleaning company. This will ensure you have a contract with a competent and efficient business that will meet the highest standards. 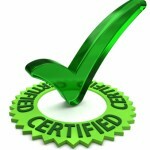 Commercial janitorial service companies will get certified when they intend to grow and become the top in their field. There are three ways a commercial cleaning company can get certification. Courses offered vary greatly in both individual requirements and company-wide needs such as EPA (Environmental Protection Agency) requirements, financing, health inspections and budgeting. The NACBC provides training and seminars with many support services. The purpose of this organization is to help new and existing cleaning company owners to start or expand their business. The company gets reliable tools that help them run a professional service. The International Janitorial Cleaning Services Association (IJCSA) has a membership of dedicated cleaning professionals. Members are well educated in the industry and have an extensive knowledge that they can put to use. Certification by ISSA for CIMS means you are looking at a company that meets high quality standards in the industry. This certification demonstrates commitment to green cleaning and a high regard for customer satisfaction. When becoming certified, there are also areas of specialization the cleaning company can elect to receive, such as eco-friendly cleaning or large commercial property cleaning. Delve into the details when hiring a janitorial service, check their certification and ensure you get the best. If your a resident of Elk Grove and need janitorial services click here.